Easy to use, just twist into existing Candelabra Adapters. Fits for all standard bulbs. 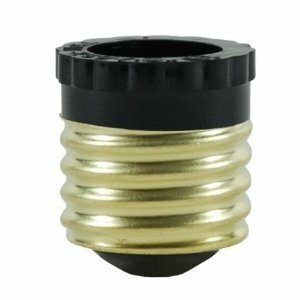 Candelabra Adapters Made of high-quality thermoplastic polymer (PBT) and copper, this adapter comes in a solid construction, high temperature resistant, corrosion resistant and anti-burning,Produces less heat, anti-burning and erosion resistant. EASY TO INSTALL:This handy adapter quickly and easily adapts any E26 Edison screw-in base lamp to an standard E12 Candelabra Adapters. Simply screw an E26 base lamp in this Candelabra Adapters , then screw the adapter to any E12 standard socket.Ideal for ceiling fans or lights with candelabra sockets that need to be converted to a standard medium base.